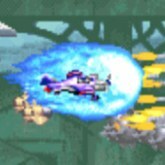 Description: Progear is an amazing Shoot em up arcade game created by Capcom released in 2001. This is my personal favorite horizontal arcade shoot em up. The 2D graphical sprites and effects, music, airplanes, levels, and enemies are all very impressive. Choose from two different air planes, shoot fast and score as much as possible. The upgraded firepower can become very intense, making some situations against enemies very intense. Oh and the bosses are crazy also. This entire game is mind blowing, just give it a try and keep on in-certing coins, you are going to need them :D.